Here is a sweet deal! 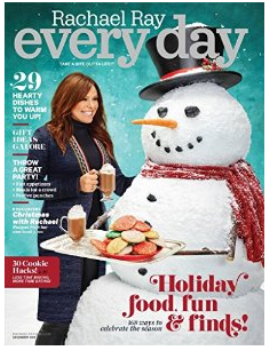 Every Day with Rachael Ray magazine is on sale for only $3.99. Use promo code 15SS0103 at checkout to save an extra 15% off, which will bring your final price down to only $3.39! Offer valid through today, December 31st, until 8:59 PST. Everyday with Rachael Ray is every busy home cook’s go-to-guide for great food, good fun and inspiring ways to relax, laugh and enjoy life. Each issue features 30-Minute Meals, Weeknight Menu Planner, $10 Dinners, Rach’s faves for fun, beauty, style and home, plus hundred’s of food and entertaining tips. Everyday with Rachael Ray brings you smart entertaining, delicious food and spur of the moment travel plus so much more. If you love cooking then Everyday with Rachael Ray is a magazine you will thoroughly enjoy each and every time it arrives! No auto renewals. Be sure to confirm the price is correct, before finalizing your order. Daily deals may change at any time, this deal was valid when posted.